Beautiful plant with characteristic pectinate and innocuous spines. Origin and Habitat: Mammillaria pectinifera is narrowly distributed , with 19 subpopulations well fragmented in the Tehuacán-Cuicatlán Valley, in the state of Puebla, Mexico(extent of occurrence is 4,000 km2). 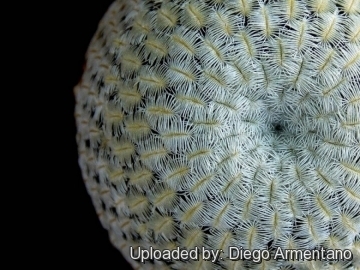 The plants in northwest of Oaxaca correspond to Mammillaria solisioides, which Hunt et al. 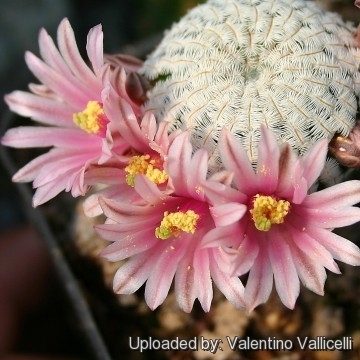 (2006) consider to be a subspecies of Mammiillaria pectinifera (subsp. solisioides (Backeb.) D.R.Hunt). Altitude: 1600-2300 metres above sea level. Pelecyphora aselliformis var. pectinata hort. Mammillaria pectinifera f. albiflora hort. Mammillaria pectinifera f. cristata hort. Neomammillaria pectinata f. cristata hort. Pelecyphora pectinata f. cristata hort. Solisia pectinata f. cristata hort. Mammillaria pectinifera f. monstruosa hort. Solisia pectinata f. monstruosa hort. 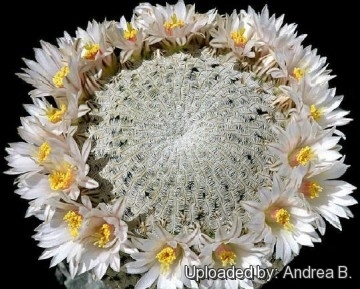 Description: Mammillaria pectinifera, previously known as Solisia pectinata, is a small cactus that in habitat appears above the ground as a squat stem completely covered by flattened spines, and usually solitary, but in cultivation it will eventually produce clustering off-shoots with age. Stem: 1-5 cm in diameter; with latex, spherical, flattened, centrally depressed, In cultivation the plant's stem may be cylindrical. Spines: 20-40, pectinate (comb-like), flattened against the body, fine, numerous, white, 1.5 - 2 mm long. Lacking central spines. Flowers: Medium-sized in a ring around the sides of the globe, white to pink with darker mid-strip, 20-30 mm long and also in diameter. Stigmas are green. Booming season: The species flowers from December to March. Reproduction in habitat starts at an age of eight years. Fruits: Small, red a maturity, barely emerging above the spines. Seeds: Black. Seeds are retained among the plant tubercules, and are released gradually. 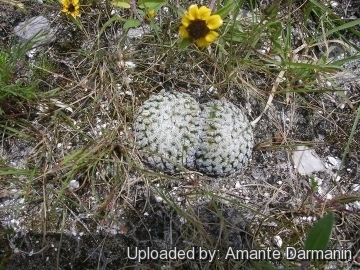 Mammillaria pectinifera F.A.C.Weber in Bois: It is a small cactus that in habitat appears above the ground as a squat stem. Spines: 20-40, pectinate, flattened against the body, fine, numerous, white, 1.5 - 2 mm long. Lacking central spines. Distribution: Puebla. Mammillaria pectinifera f. albiflora hort. : has white flowers. Garden origin. Mammillaria pectinifera f. cristata hort. : crested form. This plant has different crested forms, some very thin and other wide and strong. Mammillaria pectinifera f. monstruosa hort. : has apparentely spineless, creamy-white, extremely elongated areoles, but if you look carefully, they are formed by extremely, short bristle-like spines that give the areoles their characteristic felty appearance. 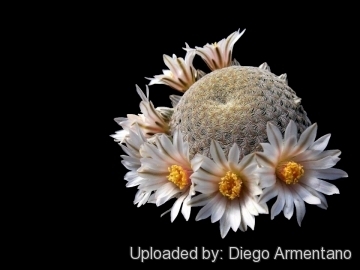 Mammillaria solisioides Backeb. : has only 25, flexible, chalky or dirty white, less pectinately arranged than the type and flattened against the stem surface, to 5 mm long. Central spines: Not present. Distribution: Oaxaca and Puebla. 1) Valverde, T. & Zavala-Hurtado, A. 2013. 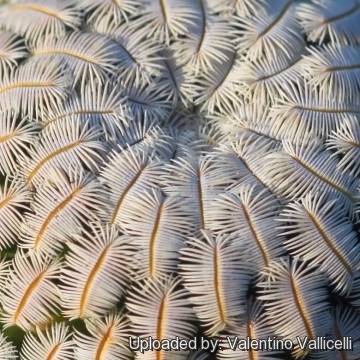 Mammillaria pectinifera. In: IUCN 2013. "IUCN Red List of Threatened Species." Version 2013.2. <www.iucnredlist.org>. Downloaded on 16 February 2014. 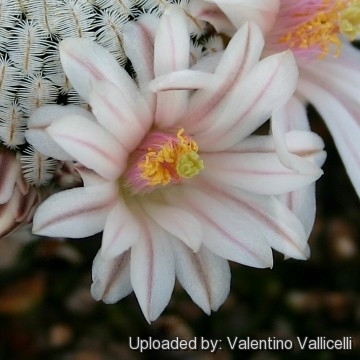 3) John Pilbeam (1999) “Mammillaria The Cactus File Handbook” Nuffield Press. 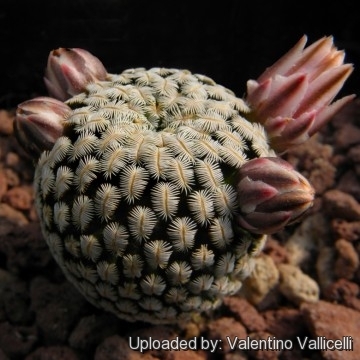 Mammillaria pectinifera Photo by: Andrea B.
Cultivation and Propagation: Slow growing, this plant is very rot prone and temperamental when cultivated on its own roots, but it is easy to grow if grafted. 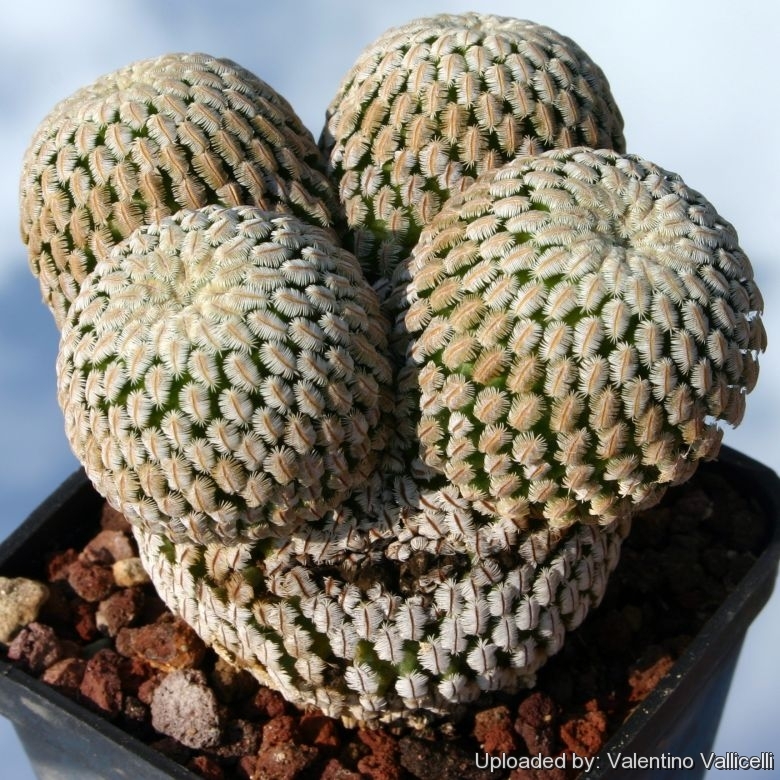 Potting subtratum: Mammillaria pectinifera has a fairly large tap root, and should be kept in a deep pot with a very draining mineral substrate. Moisture: Water regularly during the active growing season (spring and summer), this will encourage steady growth. But be careful with watering, which all thick rooted species require (rot sensitive). Keep dry during the winter rest. Feeding: Fertilize every 2 weeks with diluted high potassium fertilizer when the plant is in bud. Exposition: Light shade or full sun exposures. Traditional uses: Though sometimes called peyote, there is little evidence for the ceremonial use or psychoactive properties of the cactus.